I get really bored talking about Still Light, so I figure you must be bored hearing about it. All I’ll say is, it has been placed on hold yet again (with just 2 sleeves to go). My niece’s first birthday is coming up in less than 3 weeks and I wanted to make her something and I didn’t want to chance not getting it done in time if I. didn’t. stop. knitting. Still. Light. Fast forward to this morning. Damian left for work hours before me. I wake to find this on my living room floor. Oh crap I thought. She’s got a taste for it. She’s somehow managed to find the left-over Cleckheaton Country Wide I made the Latte Baby Hoody with. Oh she must have got into my basket. Never mind I thought. No harm done. I’m beginning to sound like ‘those’ cat people that blame themselves for their cats destroying their knitting. Sadly, I’m beginning to see it from their perspective. So off to work I go, with the yarn safely shoved into the kitchen bin. 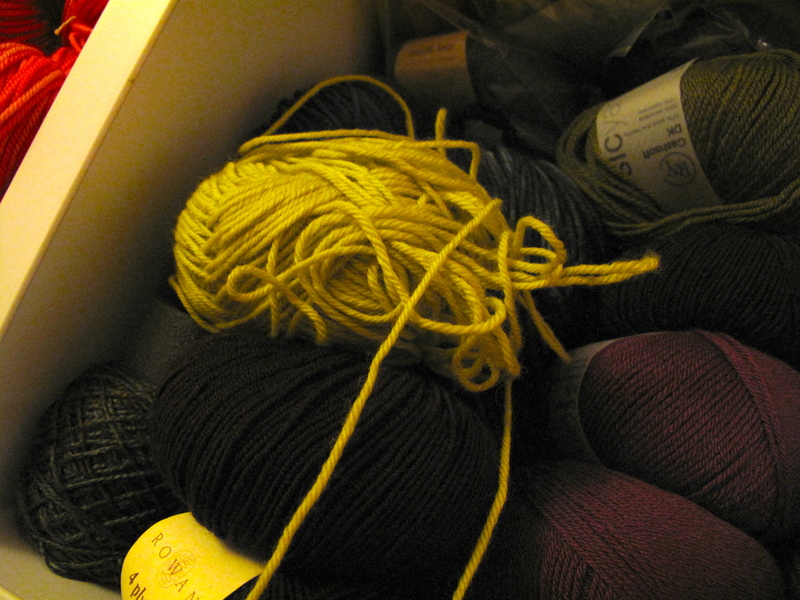 At some point I unconsciously consider, ‘gee that was a lot of left-over yarn she got a hold of’. Way more than I thought I had… after all, I didn’t have enough to even make a ‘baby’ pocket on the jacket as I’d hoped. I pushed the thought out of my head. This is where I freak out. I carefully untie my project bag and then I hold my breath for the safe return of my knitting project. (At this point I think Purl walks sideways out of the room). Thankfully the project is intact. 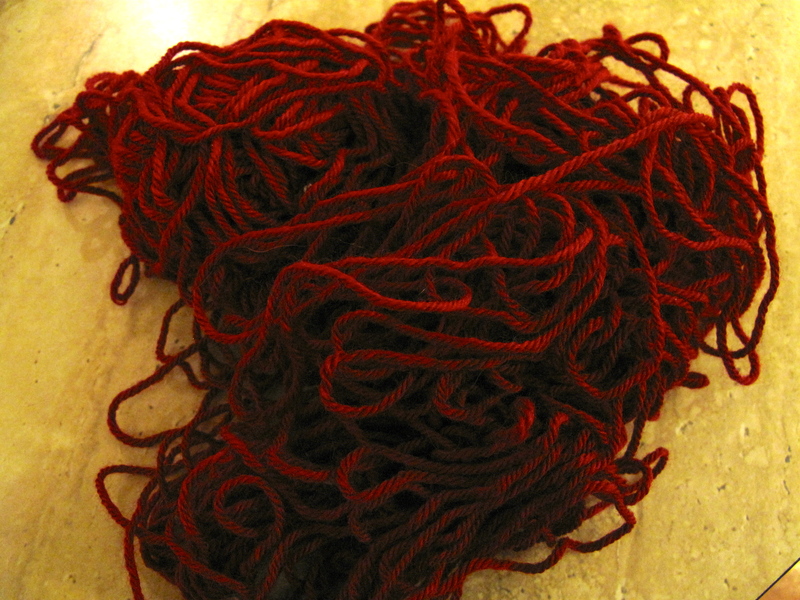 I go to the bin and yank out the red yarn. It is not the Cleckheaton Country Wide wool, I’d originally thought. 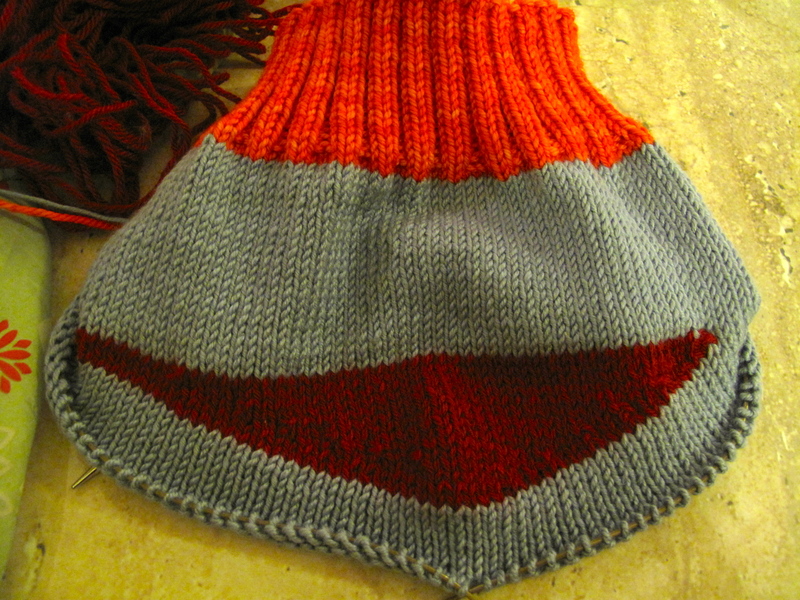 It is the Jo Sharp DK wool, which is the monsters mouth in my niece’s project. Woe. Oh. Oh well. At least I’ve already done the mouth, nevermind I wanted to use it for stripes as well. There I go again sounding like one of those cat people. The project is Das Monster. Toddler monster pants! I love them and have wanted to knit them forever. If there’s time, I’ll make my niece a cardigan too. Purl cannot be trusted. Ever. She has a taste for yarn with some grit. The Rowan yarn sits unharmed in baskets totally at her reach. Purl loves yarn, just like me. It never ceases to amaze me how picky a cat will be with yarn. Lilah LOVES jo sharp tweeds, but also stole and stashed a ball of Katie’s Panda Heath! She also stole a ball of Jet and hid it behind the couch… At least lilah wasn’t prone to destroying the balls unless they fell apart on her, she mostly just stashed them in very odd places! Thanks Jen! Purl is a bit of a demon when it comes to yarn as the pictures show! She takes no prisoners with her toy mice either… should I be worried? !